The spectacular peak of Mount Assiniboine is 11,860 ft. (3,618 metres) high and is located on the Continental Divide approximately twenty three miles south of Banff. The mountain has been called the Matterhorn of the Canadian Rockies. This winter view from an elevated scree slope overlooking frozen Lake Magog is captured in this watercolour reproduction by Canmore artist Marilyn Kinsella. 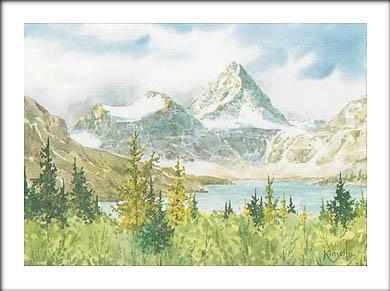 Marilyn is best known for her watercolour paintings of the local mountain area. Using a variety of perspectives, from the valley floor, an elevated ridge or a bird's-eye view, she strives to convey the beauty of these high places.